“Today we challenge ourselves to end street homelessness by 2015.” – Gregor Robertson in his mayoral inauguration speech on December 8, 2008. When Vancouver’s outgoing mayor Gregor Robertson was first elected ten years ago, he did not shy away from the issues of homelessness and poverty plaguing the city. Robertson provided Vancouverites hope and optimism that change for the better was coming to the city. However, poverty and homelessness continue to persist and flourish, while the city has become the third-least affordable city in the world. Despite (or perhaps as a result of) starting his time in office with such a bold claim, Robertson held his position for a decade before deciding earlier this year to not seek re-election. With Robertson exiting the mayor’s office ten years after his confident claim, and homelessness continuing to be one of the city’s most serious issues, it’s fair to wonder whether his words were empty campaign promises or a folly attempt to solve an issue much bigger than him. When Robertson assumed the mayoral office in 2008, homelessness in the City of Vancouver numbered 1,576, 59% of all the homeless in Greater Vancouver. 765 were in shelters around the city while 811 were on the streets. Ten years later, homelessness has skyrocketed to 2,181, with 1,522 in shelters and 659 on the street. Robertson’s time in office began well in terms of his fight against homelessness. The city opened more social housing and temporary shelters, decreasing the number of people in the street. Robertson also fostered good relations with then Premier Gordon Campbell and BC Minister of Housing Rich Coleman. With the provincial government’s help, 500 24-hr emergency shelter beds were created for the winter and the province committed $205 million for social housing. 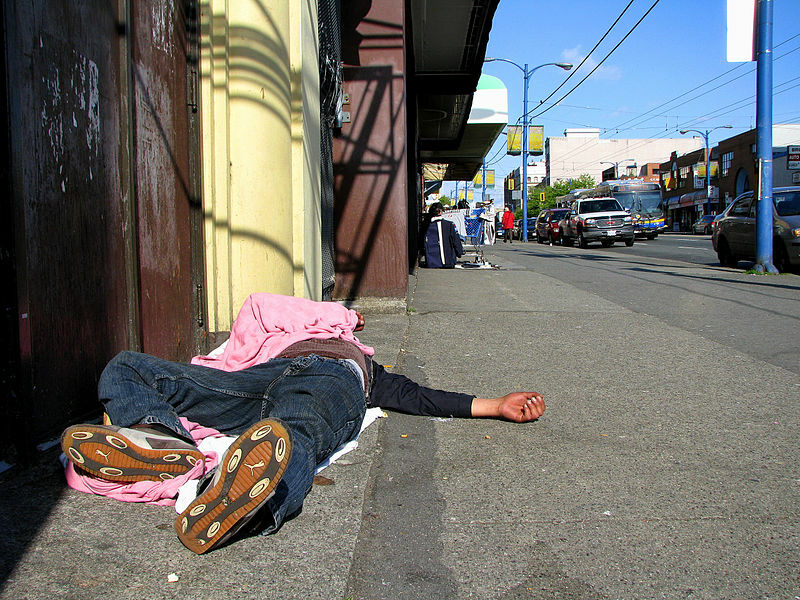 By 2011, 90% of Vancouver’s homeless were off the streets and in shelters. Despite the progress in his first term, a councillor from the previous administration asserted that Robertson doesn’t deserve all the credit for this drop in homeless on the streets, as his predecessor had already begun to buy shoddy single-room occupancy in the Downtown Eastside with plans of renovating them for use as social and affordable housing. While Robertson’s first term showed promise in his quest to end homelessness in Vancouver, much of his second term saw homelessness numbers remain relatively stable at about 1,600. In 2012, the Vancouver City Council approved an affordable housing plan directed towards increasing affordability of housing for those with low to middle-incomes who were being pushed out of the city and into the suburbs as a result of high living costs. However, 2014 saw a spike in homelessness to over 1,800, a third of whom were unsheltered, though Robertson deflects much of the blame to the election of Liberal Premier Christy Clark. Though Robertson’s second term ended rather poorly, he started his final term by creating the Vancouver Affordable Housing Agency (VAHA) in 2014, whose mandate was to create rental units on the city’s land directed towards households making $20,000 to $80,000 per year. The VAHA had originally made the goal to provide 500 units within the first three years of its conception. As of January 2018, however, only 40 units had been produced, with plans for 759 more. A year later, on June 29, 2015, Robertson put forward a motion for living wage in the city, though it never came to fruition. Despite Robertson’s efforts, homelessness numbers remained high, rising from 1,746 in 2015 to 2,138 in 2017, with the proportion of unsheltered homeless rising as well. However, the 2017 British Columbia provincial elections saw Christy Clark’s Liberal government lose a vote of non-confidence and be replaced by the NDP led by John Horgan, providing Robertson a more sympathetic and supportive premier. In September of 2017, Horgan and the NDP government announced the funding of $66 million for 606 units of temporary modular housing in Vancouver, where residents are provided both provisional housing and support systems, such as life skills training and health and social services. Building on these efforts, Robertson and the city of Vancouver announced plans for 1,000 new units of affordable housing for households making less than $80,000 per year on May 4, 2018. A month later, on June 1st, the NDP provincial government raised minimum wage across BC from $11.35/hr to $12.65/hr. Moreover, 2018 has also seen the city implement an empty homes tax to help alleviate the city’s rising housing prices. Thus far, the city has collected $18 million from the tax with expectations of $30 million more by the end of the year. Although it is an attempt to address Vancouver’s already distressed housing situation, the tax is not without its critics who believe that the city is not getting to the roots of the issue. While the statistics indicate a complete failure in Robertson’s attempt to end homelessness in Vancouver, it is unfair to lay the blame solely on his shoulder. Robertson himself places some blame on senior governments (provincial and federal), who typically partner with cities and their housing projects, for failing to pull their weight. Harper’s Conservatives failed to invest in housing to the degree necessary to alleviate Vancouver’s homelessness problem, while Clark’s Liberals did little to help the biggest problem in the province’s most prominent city. According to a report from the University of Montreal, British Columbia is the only province in Canada to not even consider a strategy of poverty reduction. Compounding this lack of support form upper levels of government, a study found that half of the homeless in the Downtown Eastside (one of Vancouver’s most impoverished areas) came from outside of the city. Allegations that other provinces were sending their homeless to Vancouver only deepened the issues, creating more barriers for the mayor. However, the shortcomings of senior levels of government do not absolve Robertson from all blame. According to his predecessor Sam Sullivan, Robertson failed to heed all the advice given to him when he cozied up to then-premier Gordon Campbell, but alienated himself from the senior staff on the city council who would have been important in Robertson’s effort to end homelessness in Vancouver. Given that the mayor of Vancouver has no real executive powers, the role is largely ceremonial and symbolic, support from the city council is integral in forwarding policies and initiatives. Furthermore, Suzanne Anton, Attorney General of BC form 2013 to 2017, has stated that Robertson never contacted her while she held her position to discuss homelessness in Vancouver. Robertson has also had his intentions and motivations called into question when being criticized for allowing the housing crisis to spiral out of control. Considering the fact that Robertson’s largest campaign contributor was the real estate industry, it is a fair and valid concern. While the VAHA struggled to produce its units of affordable housing, private developers were churning out buildings at market-value much faster. Nevertheless, there is also evidence that Robertson made use of city powers to force the private sector to aid in the endeavour for affordable housing. Robertson is also criticized for failing to maintain and support single-room-occupancy hotel rooms, which are seen as “housing of last resort” for the city’s most impoverished population, yet the number of units available has dropped significantly. While the city’s project of creating social and rental housing should eventually recuperate this loss, Robertson has also come under fire for failing to protect the tenants of these rooms from abusive slumlords. While Robertson’s claim that he would end homelessness in Vancouver by 2015 never came to fruition, he holds no regrets as he leaves office. It’s clear that Robertson made mistakes throughout his mayoral terms, but it is also clear that he lacked support from the senior levels of government. The context has changed for incoming mayor Kennedy Stewart, who enters office with more sympathetic leaders in senior levels of government in this quest to end poverty and homelessness in Vancouver. Both Trudeau’s Liberals and Horgan’s NDP have taken steps to address the issues of poverty and homelessness, providing Stewart allies right from the get go. At the time of Robertson’s ascension to power, I was too young to understand the gravity of his bold claim. However, as I grew older and involved myself in the community, I came to realize the challenge he faced. Towards the end of high school, I was invited to join Bumpin Bakery, a non-profit organization that goes to the Downtown Eastside of Vancouver every Sunday, where poverty and homelessness run rampant, enabling me to learn more about poverty and homelessness. While the roots of these issues are well-documented, namely substance abuse, mental illnesses, and rising costs of housing, they continue to persist as an asterisk when marketing Vancouver as a progressive, metropolitan city. My conversations with the those living in the area exposed the realities of the situation. While I would hear great personal stories of overcoming adversity and mistakes, I would often hear that living in the area had only gotten worse and there was little, if any, visible progress. Poverty and homelessness are not issues that can be resolved in the short-term. While increasing shelter capacity and social housing are steps in the right direction, Vancouver needs to invest in the people and enable them to find ways that keep them off the street for good. While the city has taken steps to promote and stimulate equitable development and growth, more attention and emphasis must be dedicated towards them. In particular, Indigenous peoples continue to be disproportionately represented in homeless and poverty statistics, though that is an issue much larger than the scope of just Robertson’s involvement with homelessness. The growing housing crisis and apathy towards the situation are just two obstacles the city faces. At times, it seems that homelessness in Vancouver is a matter of fact and something to be accepted. When social and affordable housing units are proposed, residents of the neighbourhood at times push back out of irrational fear. Homelessness and poverty are societal problems. They are indicative of the society’s values and morals. While the government attempts to find ways to get people off the street and help them return to society, the rest of the population must let go of stereotypes and “not in my backyard” attitudes. For Vancouver to truly become the progressive, modern, and cosmopolitan city that it claims to be, both the government and citizenry alike must reach out and lift up the marginalized and forgotten.